Okay so I am about to burst from the anticipation. One of my dearest friends, Ali has a twin sister, Lisa who is in labor as I type!!! He may even already be here by now because the last update I got was that she was about to begin pushing and that was over an hour ago. His name is Oliver Cash and he is one lucky little guy! 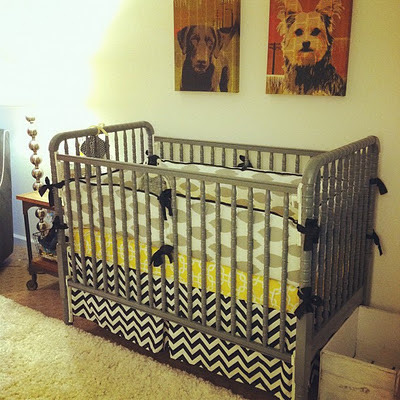 Not only does he have a family who already loves him to pieces, look at his nursery!! How cool is that? 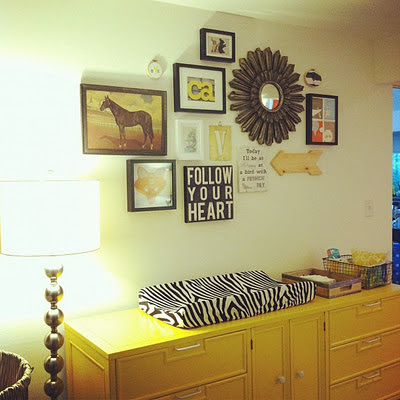 Makes me wish I was in the blogging world when I decorated my girls' nurseries. And since Oliver is clearly going to be the trendiest and of course cutest new kid on the block I had to send Lisa and her husband, Josh, some cool and hip baby gifts. Every baby needs a blankie, lovey, or in the case of my girls, a "taggie". Babies love tags. So I made a tag blanket for Oliver. I used organic cotton flannel from the Cloud 9 Forest Friends line. This is G'nite Owl and Crumbs in Earth. The back is chenille. How cool are those vespas? And I wouldn't be a true craft blogger if I didn't send Ollie a freezer paper stenciled onsie! That Oliver is one lucky baby! And, now the coolest kid on the block. Great job. You ooze talent, Andi! Oliver is a lucky little man! Welcome to the world! 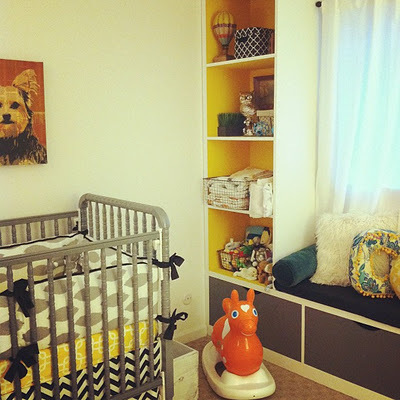 The nursery is very cool and the gifts are adorable! so fun! i love the vespa fabric!!! it's awesome. and you know i love those colors! Seriously amazed by your sweetness and your sewing talents! You are never allowed to clain to be "not that great." Nope, those days are over!!! I love you soooo much! Thank you for heping us spoil that baby boy. I am so in love! I was thinking about making my sister a taggie blanket (she's due this spring) but hadn't figured it out. Maybe I'll give it a shot! Those are amazing presents! I love your fabric choices...welcome Oliver!